Question: What is 'bounce angle' and what does it do? 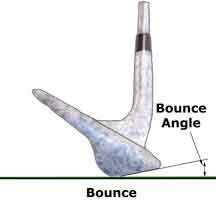 Well, bounce is the angle formed between the leading edge of the club, the sole and the ground. The bounce angle is really only prominent in wedges and lofted clubs. Secondly, ‘What does it do? Bounce is there to help you get out of bunkers and long grass. It provents the club from digging into the ground, allowing it move freely through the grass or sand for better contact of the ball. So when playing bunker shots, you don’t need to be afraid of taking sand because the bounce will stop the club from getting stuck. However, clubs with a high bounce angle will be more difficult to play from hard surfaces such as links courses, so many people choose to play a 'chip and run' with a low lofted club in the situations. I will be posting my own hints and tips to help you improve and enjoy the game a little better. So make sure to subscribe to be kept updated. Also this is the blog where all your golf questions can be answered by a PGA Professional. So, if you have a question on anything related to golf then post it here and I will answer. It could be on anything from equipment to rules or short game, it doesn’t matter.